England's set-piece may have not hit the heights against Wales that Stuart Lancaster would have expected but in his view this current team has the X-factor. The starting XV is perhaps closest to what Lancaster envisaged his ideal England side would be when he took on the job in 2012. There is a drop of experience, some who have come in from the cold based on consistent Premiership form and the starry-eyed youngsters who have found their feet quicker at Test level than coach dared hope. 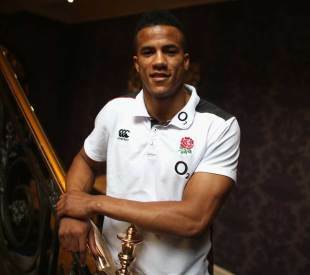 Of the youthful stars with the X-factor, look no further than Anthony Watson. He has been on Lancaster's radar since he was 17. Then, at London Irish, Watson was earmarked as a potential England star of the future - sport was in his DNA (he'd had trials for Chelsea) but there are plenty of cautionary tales of players who have failed to fulfill their potential. But Lancaster has treated Watson slightly different to others. He saw the talent and chose to integrate him slowly into the Test team. It started with Watson attending training sessions in last year's Six Nations; he then featured in their non-capped match against the Crusaders in the summer. "We have the ammo to attack teams on all fronts but we want to build the score first"
"I'm trying to take it in my stride," Watson says. "It was massively eye-opening when I came into training the first time. I didn't really realise the amount of detail behind the scenes on analysis and how each player has that responsibility. "Also there was the level of communication. It might be seen that on the wing you don't have to communicate that much but it's a pivotal position, especially in defence, and that's what I had to learn in this environment." Watson made his first Test start against Bryan Habana last November and baptisms of fire don't come much hotter. However, his work with mind skills coach Don Macpherson meant he relished the occasion rather than crumbling under the pressure. He came through that Test and as Lancaster assesses this current team, Watson has every chance of being a mainstay. "Judging on his form so far - he's been thrown in at the deep end as an international player - what impresses me most about him is the basics done exceptionally well," Lancaster said of Watson. "So if you watch him in training, which I do all the time, [he is able] to understand the defensive system and make good decisions: whether to come up and make the tackle, or to back off when he's outnumbered. "His aerial skills are exceptional; I thought two or three times at the weekend, it was a 50:50 and he came up with the ball every time. He could be exceptional for us. He's still growing and he's still only 20; he's been a real find in the last six months." Watson is exciting but he is just one potential producer in the England side of what Lancaster calls moments of magic. "I do think we have more now [players of that quality]," Lancaster said. "People like JJ [Jonathan Joseph], Anthony [Watson], Ben Youngs, George [Ford]. Further down the line there will be others who come into the equation like Manu [Tuilagi]." Watson and Joseph may have claimed the headlines following the win over Wales but they will be mindful of letting the circus get to them. Danny Care's experience serves as a warning. Heading into the November Tests, he was the undisputed first-choice scrum-half but three games in and he was banished from the matchday squad after two shaky performances. Now, he is third in the pecking order. The battle for places goes on and, in Lancaster's mind, with quality on the sidelines such as Brad Barritt, it is a healthy antidote to the curse of complacency. "There can't be any complacency with the quality of players coming back," Lancaster said. "You need strength in depth to win a World Cup. You don't win a World Cup with 15 players. As New Zealand showed, it could be the third or fourth choice who plays in the final. "You also need competition. When they come into training here one of the tricks for me is to make sure they remain competitive but put the shirt first, so the competitiveness doesn't become disruptive." It will be the first match at Twickenham for George Kruis and Jonathan Joseph on Saturday. They fit into the starry-eyed youngster and individuals taking their chance categories but, previous failings, have been repeatedly warned about the dangers of complacency. Asked about last Friday's win in Cardiff, Joseph was keen not to dwell. "It was a great day, great occasion and you have the weekend off but you are straight back in on Monday," he said. "My focus this week has been on Italy and what they will bring on Saturday. England have all the attributes to play a great attacking game. "We have the ammo to attack teams on all fronts but we want to build the score first. We can't just go out there against Italy and think we can jouer, jouer [play, play] and score tries. It's an international game and we need to play it accordingly."